In part 1 of this series, we took a look inside the ODA to see what the OS was doing. Here, we’ll dig in a little further to the disk and storage architecture with regard to the hardware and ASM. There have been a lot of questions about the storage layout of the shared disks. We’ll start at the lowest level and make our way to the disks as we move down the ladder. 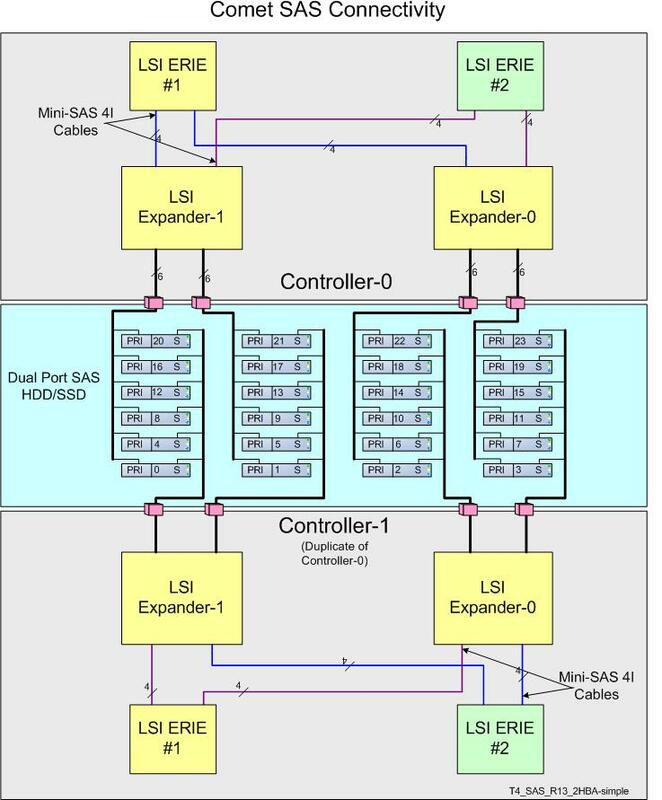 First, there are 2 dual-ported LSI SAS controllers in each of the system controllers (SCs). They are each connected to a SAS expander that is located on the system board. Each of these SAS expanders connect to 12 of the hard disks on the front of the ODA. The disks are dual-ported SAS, so that each disk is connected to an expander on each of the SCs. Below is a diagram of the SAS connectivity on the ODA (Note: all diagrams are collected from public ODA documentation, as well as various ODA-related support notes available on My Oracle Support). Only the loss of an expander would cause the entire SC to come down. In the event of an SSD or hard disk failure (even 2 hard disks), ASM redundancy would keep both database instances online. All hard disks and solid state disks are hot-swappable, so there is no downtime to replace a disk. You would have to power off the SC to replace a SAS controller, but the SC would still have a path to all disks until that maintenance window, leaving you the ability to take it down at your convenience. The unaffected SC would continue to run without issue. This also applies to other hardware failures local to a single SC. The only components shared between the SCs are the SSD, hard disks, and power supplies (all of which are redundant). As you can see, /dev/mapper/HDD_E1_S15_975079031 resides in expander 1, slot 15, and has 2 partitions (p1 and p2). It is these disks that have been defined by device mapper that are added to ASM. One thing that is gleaned from this is that the disks are actually partitioned, which is the opposite of how Oracle’s other engineered database system (Exadata) handles disks. While Exadata storage servers use the concept of physicaldisks, celldisks, and griddisks, the ODA goes back to the tried and true method of standard disk partitioning. When configuring the ODA, you are given the choice of whether you would prefer backups to be internal or external to the ODA. Naturally, choosing “internal” makes the RECO diskgroup larger, while the choice of “external” gives about an 85/15 split in favor of the DATA diskgroup. The compatible parameters are set to 11.2.0.2, and cell.smart_scan_capable is set to false. From this point, the ODA is just a standard RAC system that has direct-attached shared storage. That’s about it for now. I’ll be back soon with another post surrounding the usage of the new Oracle Appliance Kit (oakcli) that is used to manage storage and other components of the ODA. Hello, in connection with your comment about the block size for the redo group created from SSD drives, can you list the init.ora parameters of the database? Redo log can be forced to use 4k block with a hidden parameter I think. Are you asking about the _disk_sector_size_override parameter in ASM? If so, that is currently set to true, but the sector sizes for each of the diskgroups is 512.
any chance that you will be doing a blog post on the Oracle Database Appliance X3-2?